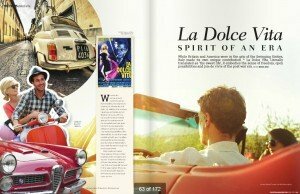 La Dolce Vita is a now iconic phrase that conjures images of the winding alleyways and Vespas of a vintage Italy. Imbued with a sense of glamorous freedom, the concept of young people living a hedonistic and self-indulgent life has long entered cross-cultural vernacular and leaves us lamenting our lack of Italian blood. Here, Michel Cruz traces the origins and inspirations for the phenomenon that has come to define an epoch. While Britain and America were in the grip of the Swinging Sixties, Italy made its own unique contribution – La Dolce Vita. Literally translated as ‘the sweet life’, it embodies the sense of freedom, open possibilities and joie de vivre of the post war era. We strive for permanence in everything we do, from installing new regimes to chasing the ultimate form of style, not realising that success, happiness and ideals are but fleeting moments. With the horrors of the Second World War and the sparseness of the immediate post war years behind it, Europe awoke like a flower in spring to a whole new world of possibilities. With Marshall Aid, the continent was rebuilding itself upon the pillars of prosperity and democracy as a tide of youthful liberalism and creativity swept through the once dusty streets. Bright colours invaded those spaces, driving out dark shadows amid new sights and sounds. It is at the confluence of these two worlds, old and new, that a very special moment in time was created. Of course an era whose spirit was born of innocence and purity could never survive. The spirit of youth is embodied in spring, that time of birth and rejuvenation, but like spring youth can only flower thanks to the seasons that came before. The young generations who saw the world through different eyes could only do so because of the prosperity and order created by their elders, who had worked and suffered to create the conditions that led directly to the Dolce Vita. Their humanistic rebellion resonated well within a gentle post war period in which many of the elements of the ancien regime were still in place. By the time these new generations had replaced the old system with their own, it no longer looked anywhere near as appealing. But in the period between the latter 1950s and 60s it seemed that the western world had found Nirvana, an era of eternal spring in which each year would be better than the one before. A fresh breeze blew old cobwebs away and invaded the world with colour and bright, sunny light. Fashions grew lighter, music tingled on the senses, art in all its forms entered a phase of intense creativity and experimentation, cinema was transformed and the world of design discovered a new language of geometry and form. The world became lighter, literally. Instead of being built inwardly, to keep everything out, homes were now designed to let in light and views, while the dark fabrics and tones that once covered almost the whole body grew thinner, lighter, more colourful and, gradually, downright skimpy. The bikini, maxi and mini followed one another in quick succession as women were liberated and young people broke down old social barriers, aided in this by the technological advances of their parents’ generation. Music became the voice of this new movement, cinema a means through which to express itself, and in so doing we see a rapid succession from the quaint through the euphoric to the destructivist era that followed the Dolce Vita – and was ultimately its product. Though leading on from it, this negative, anti-aesthetic vision of the world seems so wholly opposite to the life-loving expression of just ten years earlier. It is within the positivist environment where people believed as never before in the future that we see not only the futuristic architecture of Eero Saarinen and a veritable explosion of industrial design, but also the popularity of television programmes like The Jetsons and Thunderbirds. From Scandinavia and Italy burst forth a waterfall of new looks, materials and shapes, be it the latest Olivetti calculator, Arne Jacobsen’s Egg Chair or any of the other wonders visible at the hugely popular World Fairs. But perhaps cars embody the era best of all, creating a sense of palpable nostalgia that transmits one back to an era of soft pastel colours and creamily rounded bonnets, boots and roof panels. Iconic in this regard was the Fiat 500, the little bubble car that motorised Italy – and as the Seat 600, Spain. Entire families squeezed into this quaint little sweetheart of a car, or its Multipla derivative. The latter also dominated the street scene of Rome, Naples and Milan as the taxi of choice, bustling through the, shall we say, lively Italian traffic with typical aplomb. To alight from one of these and find yourself in the Rome of the early sixties would be to inhale the essence of an era that has gone in history as one of the most special flights of moment. 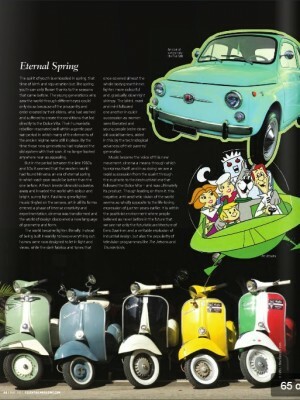 Darting around the Cinquecentos would be the evergreen Vespa scooters, symbol of the era. Indeed, with all the honking in the air blending with the sounds of Perez Prado’s Patricia and the fragrance of Italian cuisine drifting along, you could find yourself in a scene from La Dolce Vita. But this cinematic masterpiece, while visually embodying the era, also lays bare the underlying currents of a modern, consumerist world that would eventually lead to our own. In it, the freshness of the age is already tainted with jaded hedonism, lack of purpose and a sense of lost opportunities. The period that started with the gentle glamour of an older era – as represented by the beautiful Aquariva speedboats – would close with the sporty, youthful chic of the Alfa Romeo Spider, another icon of this bohemian time. Already iconic in Italy and large parts of Europe, the Spider was introduced to a global audience through the film, The Graduate. In an unwitting American sequel, The Graduate picks up the theme as the decade nears its end. Yet much of the aura remains, and the scenes once again provide iconic mementos of an era that is lost to us now, but which continues to return in retro-filled slices. In it, the Alfa Romeo Spider epitomises the leisurely abandon of the Dolce Vita, an era that may not have been quite as idyllic and carefree as we now perceive it to have been, but still one that we look back upon with nostalgia and yearning as we head into the future. Today, it is still possible to recapture fleeting moments of this youthful age; by driving through Rome in an original Fiat 500, dodging through narrow streets on a Vespa or rolling through the hills of Tuscany with the Spider’s top down it is possible to be Marcello Mastroianni or Anita Ekberg for a while. Get retro stylish, with the wind in your hair, and let the spirit and positive energy of those times fill you with Dolce Vita. This entry was posted on Monday, August 10th, 2015 at 3:40 pm	and is filed under Art, Design, Freelance Writing, Italy, Travel. You can follow any responses to this entry through the RSS 2.0 feed. Both comments and pings are currently closed.